This entry was posted on September 11, 2013 by admin. National Geographic Explorer: Marijuana Nation - Dr. Raphael Mechoulam. 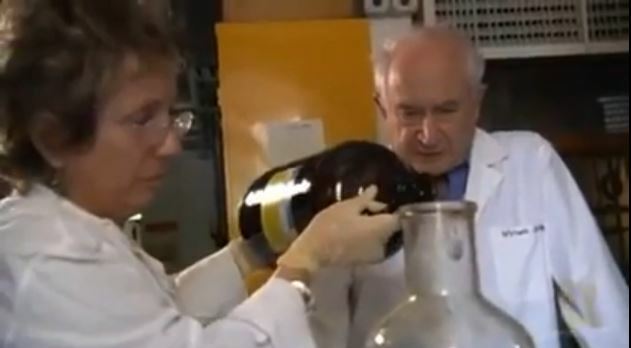 Raphael Mechoulam, while being a junior member at the Weizmann Institute of Science, succeeded in the isolation, structure elucidation and total synthesis of Δ9-tetrahydrocannabinol, the main active principle of marijuana. He later became a full professor for medicinal chemistry at the Hebrew University of Jerusalem where he established the "Department of Natural Products". His major scientific interest is the chemistry and pharmacology of cannabinoids. He and his research group succeeded in the total synthesis of the major plant cannabinoids Δ9-tetrahydrocannabinol, cannabidiol, cannabigerol and various others. Another research project initiated by him led to the isolation of the first described endocannabinoid anandamide which was isolated and characterized by two of his postdoctoral researchers, Lumír Ondřej Hanuš and William Devane. Another endogenous cannabinoid, 2-AG, was soon discovered by Shimon Ben-Shabat, one of his PhD students. He published more than 350 scientific articles.